For the 'Model Patterns', 'Process Guidance' and 'Diagram' tabs, a 'Perspective', 'Select From' or Filter Group panel on the left of the view shows a list of Pattern groups and the Patterns they contain. If you click on a Pattern, a description displays in the right-hand panel of the window, showing a type diagram (where appropriate) and an explanation of what the Pattern is and what it does. This description is drawn from an RTF file paired with the Pattern's source XML file. The 'All UML' Perspective is the default when you open the Model Wizard on a root node that has no models. This Perspective shows a list of groups of basic UML Patterns available to build your model from. The display defaults to showing the groups expanded. If you click on the drop-down arrow in the 'All UML Perspectives' title bar, a list of the other Perspective groups displays. As you mouse-over an option in the list, the Perspectives available in that group also display. When you click on a Perspective to select it, the panel is updated with the Pattern groups and Patterns provided by the selected Perspective. Again, as you click on a Pattern in the list, a description is provided in the right-hand panel. It is possible to list every Pattern Group and Pattern available in the model; click on the drop-down arrow and select the 'Manage > Show All Perspectives' option. Conversely, you can restrict the list of Patterns shown by typing a text string in the Filter Bar underneath the panel heading. Only Patterns that have that text string in their name are listed. 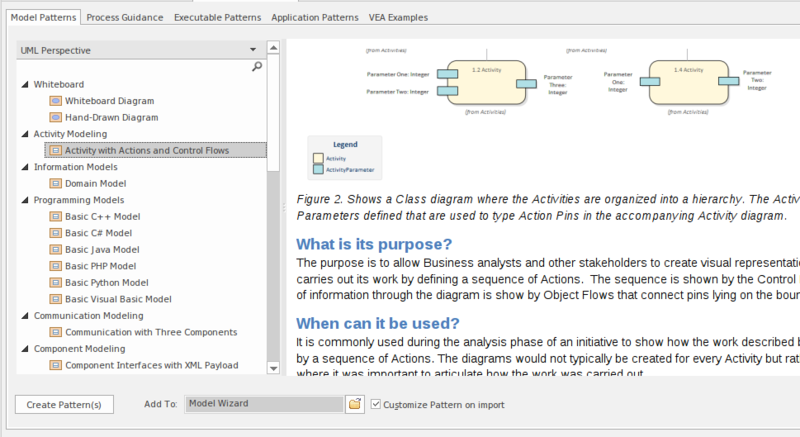 If you are a Technology Developer you can create and import your own MDG Technology, and distribute one or more custom Model Patterns from that Technology through the Model Wizard; the name of your Technology (or Technology categories) is added to the selection list for your users to access the Technology Patterns. To select a Model Pattern, simply click on it. If you want to select more than one Pattern, hold the Ctrl or Shift key down while you click on each Pattern. Click on this button to import a model structure derived from the Pattern(s) you have selected. The 'Importing Model Templates' dialog displays whilst the import is in progress, and any problems with the import are reported in the System Output window. The generated model structure displays under your selected Package in the Project Browser. A Pattern can contain several Packages; select this checkbox to indicate that you will import only some of these Packages from the Pattern into your model. After you click on the Create Pattern(s) button, the 'Select Packages' dialog displays on which you specify which of the Packages to import. The option is disabled if there are too few Packages to select from, or if it is not logical to import only some of the Packages. Select this option to import the contents of the Pattern into the selected Package. When creating a Pattern, Enterprise Architect will normally create a new Package to represent the Pattern, as a child of the selected Package. If you select this checkbox, no new Package is created and instead the contents of the Pattern are added to the selected Package (provided that the selected Package is not a root node).